Michael Malone has a diverse practice that encompasses healthcare law, litigation on behalf of health care, lawyers and law firms. Mr. Malone represents health care entities, including physicians, clinics, hospitals and other health care providers, in a variety of matters, including staff privilege issues, regulatory matters, licensing matters and the defense of medical negligence. 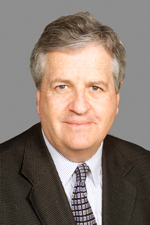 He has been the principal trial attorney in more than 100 trials decided by a jury verdict, and also represents other professionals, including attorneys, in disputes. In addition, Mr. Malone has represented numerous other parties in various business disputes, resolved through litigation and by other means. In addition to his extensive trial work, Mr. Malone has served as an arbitrator and a mediator in a wide variety of matters for the Wisconsin Court of Appeals, Milwaukee Bar Association and other entities. He was the sole arbitrator for more than 100 claims made against the Dalkon Shield Bankruptcy Trust by various claimants around the country and the world, and presided over hearings for the Private Adjudication Center of Durham, North Carolina, in Milwaukee, Wisconsin and Dublin, Ireland. Spoken to legal, professional and educational organizations, including the Wisconsin Bar Association, the International Association of Defense Counsel, Wisconsin Academy of Trial Lawyers, National Business Institute and other continuing legal education organizations. Lectures annually at the Marquette University Law School. Participant in the American Board of Trial Academy, 16th Annual Institute of Trial Practice, Milwaukee, Wisconsin, November 2005. “The Role of Resident Physicians in Medical Liability,” Medical College of Wisconsin, Milwaukee, Wisconsin, October 2004. Co-author of, "Defending Against Wrongful Birth and Wrongful Life Claims,” which was published in the Defense Research Institute’s monthly magazine.